I'm in love with this drink. Is that weird? Should I not be in love with a drink? If you taste it though, you'll know what I mean and you'll feel the same way. I had never had peach-flavored vodka before the bottle of Ciroc that appeared at my house not too long ago. I just had to taste it and oh my, was it delicious. My immediate thought was that I could either drink it right out of the bottle or, more appropriately, make the best damn hard lemonade ever. I chose the latter. But by all means, if your choice is to drink it out of the bottle, you will not be judged here, my friend. Drink the tasty vodka however you please. I'd highly suggest giving this mix a try though. I can guarantee that you won't be disappointed. 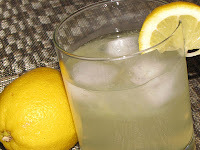 The vodka itself is amazingly fresh and smooth and the addition of club soda and fresh lemon juice elevates it to a new level that is perfect. 1. Mix all ingredients together in a shaker with ice. Store covered in the refrigerator for a few weeks.